The blueberry plant is a woody, deciduous shrub that produces edible berries from late spring to mid-summer, depending on the geographic location. The best time to transplant a blueberry bush is in late winter to early spring. Dig carefully to avoid damaging a mature blueberry bush's established roots. Fruit production may decrease during the first growing season after transplant due to the stress put on the plant. Select a new planting location for the blueberry bush that has a similar soil composition as the current growing area and receives at least six hours of direct sunlight. Test the new planting location's soil to verify it has a pH of 4.8 to 5.2. Work ground rock sulfur into the soil to lower the pH number and make it more acidic. Water the area well and let the soil rest for two weeks. Remove the mature blueberry plant. Dig 12 inches around the stem of the plant and deep enough to incorporate the root ball. Use caution when digging as blueberry plants have a shallow root system that damage easily. Gently wiggle the plant out of the ground to limit the amount of roots that break. Dig a planting hole in the new location that is twice as wide as the root ball and the same depth. Add equal amounts of organic compost to the removed soil. Set the blueberry plant in the hole and gently pack the amended soil around the roots. Water the soil well after transplanting the blueberry bush to compact the soil and eliminate air pockets. Apply 1 to 2 inches of supplemental water each week during the growing season to keep the soil moist. Do not over saturate the soil as this creates an environment for root rot. Apply a 3-to-4 inch layer of bark or sawdust mulch around the blueberry plants. This will assist with weed control and water retention. Pull weeds as they grow around the bush, as they will compete for soil moisture. Prune to remove 1/3 of the branch length after transplanting the blueberry bush to reserve energy sources for root establishment. 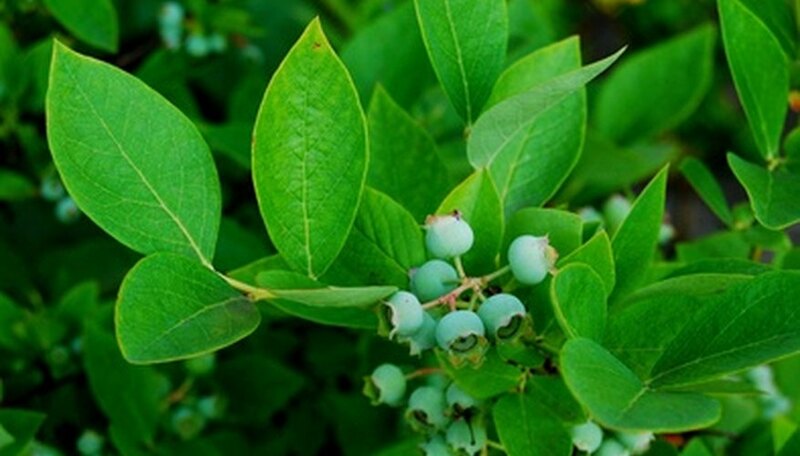 Apply a high-acid fertilizer four to six weeks after transplanting to encourage healthy growth in the blueberry bush. Follow the manufacturer's directions. Collect rainwater to use for supplemental water applications. Rainwater tends to have a higher acidic pH to assist with maintaining the soil pH.